I can only say I fully agree. But i’m Afraid this close to release (23 may) they will have there hands full at fixing what let to the shift in release date. It didn’t get postponed just to polish the game. Also ca made it clear it was a design choice due to the emphasis on characters. Although these is an awkward argument for record modes. @takilung31 , have you been keeping tabs on how the Chinese or Asian community feels about the game? Just out of curiosity, what's the general attitude of those players? Are they excited? Do they hate it? Are they even aware it exists? Some people didn't liked the unit cards in Rome 2 as well, it's unlikely that CA would change the unit cards because it would require much work, and CA had made the unit cards like that on purpose. While I personally don't mind those unit cards, I think I can understand why CA made them so bland. Notice the contrast between the character portraits and the unit cards? If we had something like WH-style unit cards, it may not be visually appealing as there would be an overload of visual information. However, something less flashy like the shogun 2 unit cards could definitely work. Doubt we will see a change though. Besides, no units cards have been released without controversy (apart from the Warhammer ones). I dislike the unit cards but more so the lacked of attention they are showing to the historical flagship. I dare to say, they will not change the unit cards. It is a design choice by the developers, it is just like adding female generals which is a design choice and it is still there despite all the SJW bashing which was even more intense. Hence, you are better off waiting for mods if this game ever comes out in 2019. So I do not like them, but im not fighting for them to change because I think its mute at this point. As to your comment, im having a hard time beleving you never choose your units on the field from the cards. When done right, they make that one elite archer unit in a squad of archers stand out more. Maybe he has a red background, or he's wearing blue armor, but the portraits usually give quickly obvious 'loud' ways to pick your unit. Usually. Honestly it just feels lazy on CA's part. I know some will try and defend it with "it's to make the character cards stand out!" I usually select the units I want based on the specific unit details showing when I recruit them, and the money I have available. That will obviously change over the course of a campaign. I no longer play MP so I don't worry about the any more. What the units look like doesn't really mean anything to me. What they can do, and how I think they may fit into the role I want them to play is what I'm looking for. Just a personal thing on what and how I play a game. Uh, yes? Of course. You pick units based on the situation/funds/army make up, not what they look like, that would make no sense. But in battle, to quickly identify units, having strongly diffrent art on the cards makes it easier to identify. I never had any issue with them in any game except Rome 2. They were truly the worst. I used to click a unit but I couldn't even tell which unit I had selected because the cards colour scheme made it very bright. So even the selected cards that were lit up were hard to pick up. Even the art direction in Rome 2 cards I wasn't a fan of. It was the first and only time I had an issue with unit cards. in my opinion Rome 2 original 2d art units cards were the best cards. Yup. The unit cards are horrible and hopefully they can change it. I can see why they've done it, it's a kind of fog of war but the parts that allow you to recognise immediately what the unit is stands out. It's a well thought out way of using them. Yep I know, but we the community should provide feedback, EG CA made woman in 3K follows their husband's name, and it was fixed shortly after. Unit Cards is something that can easily be replaced and it not much of a hard work compared to adding Romance mode + Records mode for example. Editing a character's name take nowhere near as much work as making a new art for him, also CA had made a mistake with the women names in the game, so they acknowledge the mistake and fixed that, there is no mistake with the unit cards, it's totally a matter of taste and design choice, a choice that CA already made. Also the romance mode is the main mode anyway, and CA was fairly clear about that. The silhouette cards are a weird decision, tbh, I always thought it was a beta thing. The interface is all about presentation, and having something that appears obviously incomplete when so many other things are polished just feels wrong for a premium game. Land is Kislev, Kislev is Land! We are Kislev! I quite liked the Rome 2 unit cards actually... never had an issue telling units apart either. The idea that the unit cards are designed so that more emphasis is put on the characters in comparison doesn't fly with me at all to be honest. The Character portraits are already twice the size the regular unit cards, and way more detailed to boot, so you're hardly going to click on a unit of pitchfork-wielding peasants by mistake thinking that it was Lu Bu. Plus, from a UI functionality standpoint, they really don't seem to do the job they're meant for. You can't tell "at-a-glance" what some units are; they all just look like grey smudges with some brown blots for equipment. Yeah agreed. Unit cards look to identical in the heat of battle. Not to mention the Ji (pike) vs Ye warriors (pike) which share the same unit card. Also elite units don't look elite at all if you look at their cards. I must say though that the yellow turban ones seem better. There seems to be more colour in them and emphasis on the (head/armour) gear. If CA could make some adjustments more in line with the yellow turbans I think it would be a nice step forward. 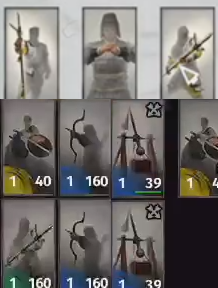 CA changed the unit cards for Rome 2, but it happen only in the Campaign Pack, CA might change the unit cards for Three Kingdoms too, but it also can happen only in Campaign Pack for it. As much as I love 3k if after 2 months of delay and we still have those faceless / blurred units, same in records then the game will have one of my negative review due to bad design. Many ppl would do the same, this is a big issue same with battles. So if the unit cards are not changed, you will ignored everything else you may like about the game? Seems a bit harsh.